Chkdsk is a utility that checks your computer’s hard drive status for any additional errors with the hard drive. It is a built-in utility of windows used to check for errors in the disk media and the files. To detect and fix the file system and disk error corruption, we run with the built-in Windows Check Disk Tool. The ChkDsk.exe checks the file system errors, bad sectors, and so on. Two versions of this utility in windows. One is the basic version and another is the command line version. My Computer > Properties > Tools> Check Now. Tap on the “Automatically fix file system errors and scan for and attempt recovery of bad sectors” option. Command Prompt(run as administrator) > type chkdsk, run it in a read-only mode and display the status of the current drive. /V: Shows the full path and name of every file on the disk in FAT OR FAT32. 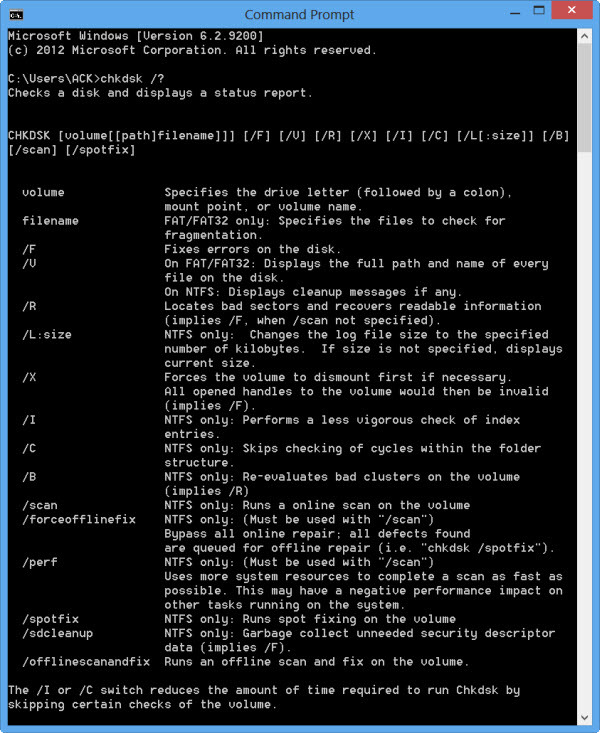 In NTFS volume, it shows the cleanup messages. /R: locates the bad sectors and recover any readable pieces of information from them. /I: run faster by skipping over certain regular checks. /C: same as /I but this skips over cycles within the folder structure to reduce the amount of time that the command runs. /L:size, this option is used to change the size of the log file in KB. The default log file size is 65536KB. /scan: runs an online scan on an NTFS volume but it does not repair it. /spotfix: It dismounts the volume only in order to fix the issues that were sent to the log file. /? 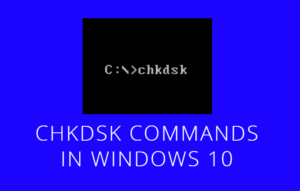 : , It uses the Help Switch with the chkdsk command to show a detailed help about the commands listed above. The chkdsk utility is not for all hard drive and files system problems that you encounter. It is an important tool in the System administrator toobox. Using this microsoft utility , the critical point is not to delay too long and thereby placing your NT system data. If you have any queries or suggestions , you are free to comment in the comment section.